I first mentioned earthcaches in the context of my trip to Banff last month. Run by the Geological Society of America, the earthcache program encourages people to visit sites of geological significance and learn something about them. I visited three in the Banff area. Soon afterwards, I learned about the Earthcache Masters program. 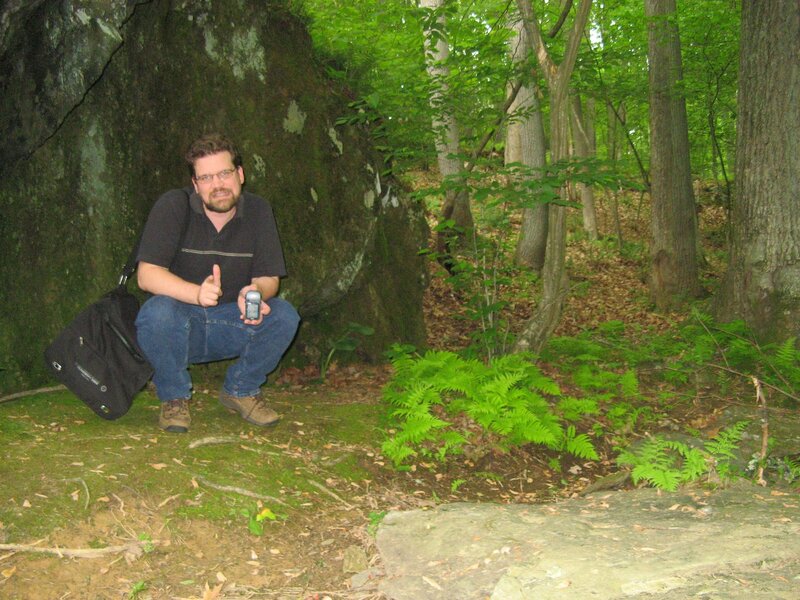 By visiting three earthcaches in two states or countries, I could qualify as a "Bronze Earthcache Master". Since all of my finds were in Canada, I needed to visit one some place else. So after Christina and I visited one near Laurel a week or two ago, I sent my information in. Today in the mail I received my very own bronze earthcache master pin. To reach silver, I need to visit a couple more and involve at least one more state/country. That's the easy part. The hard part is that I would have to place an earthcache myself. That would involve finding an interesting geological feature, writing it up, and perhaps most challengingly, getting permission from the park or wherever it ends up. I haven't decided whether I'm up for that; I guess I'll try visiting the next two first and see how that goes. Well, the It's Not About the Numbers site is improving, so I can post this new Maryland county map. I'm up to 8 counties with the addition of Charles. 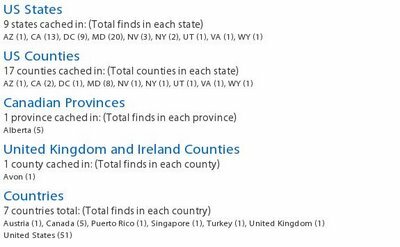 Also, I've bumped my PG County total into the double digits, and I now have at least two finds in each of the surrounding counties. I suspect the far reaches of the state -- the Western Panhandle, the parts of the Eastern Shore not right across the bridge -- will require coordination with special trips. In particular, the western counties might be do-able on the way to ski at Wisp next winter. Yesterday and today I made progress on two of my geocaching goals. First, I knocked the number of remaining caches in my self-imposed "virtual challenge" down from 125 to 122. Second, I increased my number of Maryland counties with cache finds by 1, to 8 (out of 24*). Friday evening, Christina and I went to the Fairland Regional Park, near Laurel, where a display on stormwater management served as an earthcache. It was fun to walk around. We made an abortive attempt to find a physical cache as well, but found 4 deer instead. 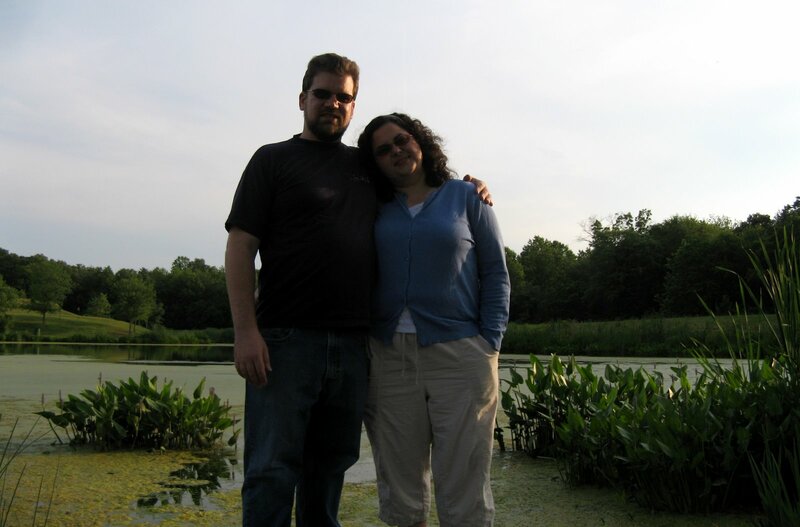 Today, I went driving around to do some caching while Christina hung out with my Aunt Sally. 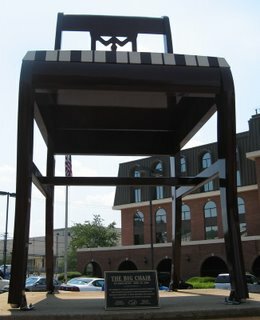 My main goal was Charles County, but along the way I decided to visit a virtual cache in Prince George's County. Along the way to that, I found myself driving through DC near another virtual -- a giant chair. After the giant chair, it was time to visit National Harbor, PG County's new billion-dollar waterfront development. 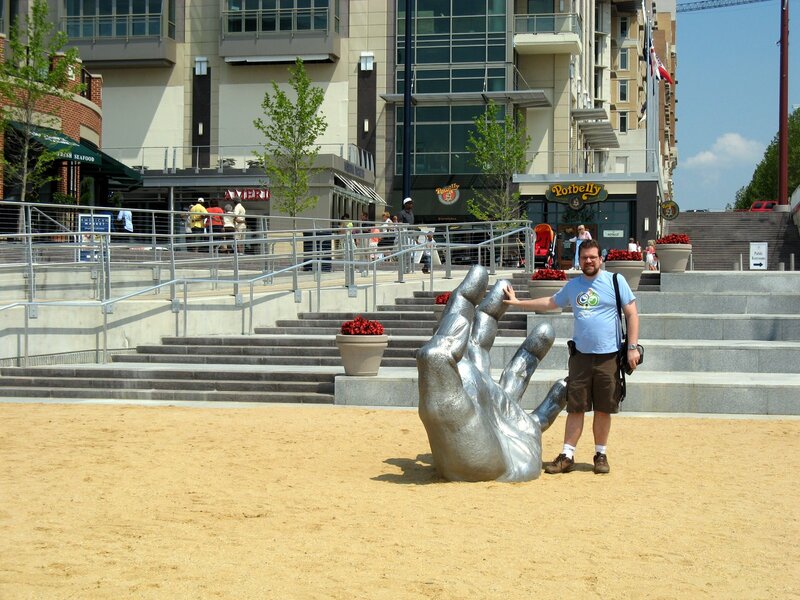 A statue of a giant buried in sand had recently been moved from DC. Since the statue was a virtual cache, the cache moved, too. After that, I drove down to Charles County. 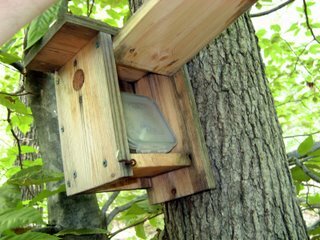 Pictured is the first cache I found, cleverly disguised as a birdhouse. I found a second for good measure before returning home. Unfortunately, the site I use to generate all those neat stats is having technical problems, so it may be a while before I post them again. I donated $5 and sent some words of encouragement. I also posted in the geocaching forums inviting others to do the same, so hopefully that will do some good. *Including Baltimore City as a county, for these purposes. As previously mentioned, I've been enjoying doing virtual caches lately. As also previously mentioned, no new virtual caches have been allowed since 2005. I decided to combine these observations by trying to do all virtual caches within 70 miles of home. Since nobody can create virtual caches any more, I don't have to worry about new ones popping up faster than I find them. To throw a wrinkle into the plan, I am also allowing two types of virtual-like caches: earthcaches and webcame caches. Webcam caches are ones where you go to the coordinates and then get somebody in front of a compute to find you on a particular Internet-connected camera. They save that picture, which is your proof of having visited that "cache". I have never tried one of these, but I figure they fall into the spirit of virtual caches. I did three earthcaches in Canada last month. Unlike virtual caches or webcam caches, people are allowed to create new ones. On the other hand, there are only 26 on my list, so I don't feel like I'm in much danger that they'll be created too quickly for me to handle. Why 70 miles? Two reasons. One is that I'm about 62 miles from Gettysburg, so that distance is far enough to include a trip up there to get the virtual caches there. The other reason is that right now there are 125 left to do within 70 miles, so it makes a nice number from which to begin my countdown. I thought I'd post about this goal, so I could give updates in the future. I'll probably get started this weekend. 27 of the 28 closest caches on my list are in DC, so that makes a good way to get a bunch at a time. I've plotted a walk around the western section of the Mall that should get 12. On the other hand, some of the other caches are fairly remote....I'd be surprised if I finished within a year. I dropped off my Free State Mover #3 geocoin in Banff last month with the mission "to return to the United States, specifically Maryland, specifically inside the Capital Beltway." I included with the coin a note explaining the mission. I figured it would be easier to get this one back than the ones I had dropped off in England and Austria. So you can imagine my surprise this morning when I discovered the coin had ended up in Sweden. Sigh. Since I last posted about my geocaching activities, I've been on somewhat of a tear, by my standards, finding 9 caches in a span of 4 days. I enjoyed finding 2 virtual caches in DC over Memorial Day weekend, so took the Metro into town again and found 7 more last weekend. 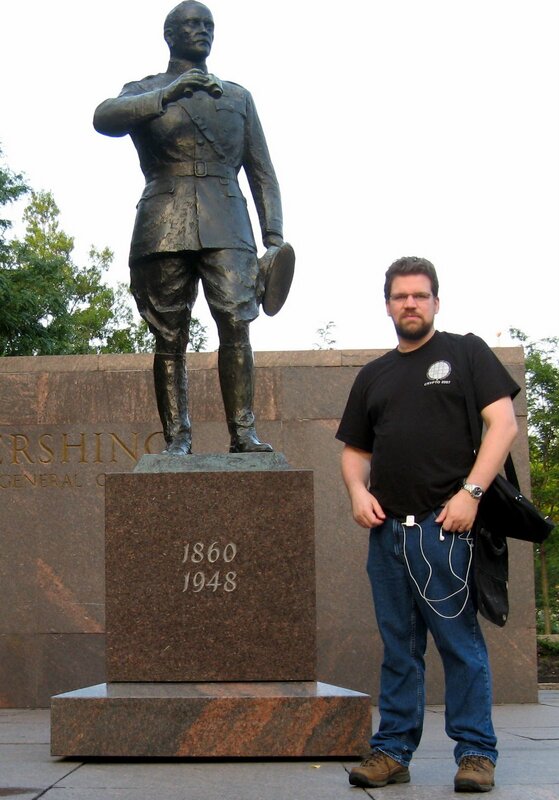 One of them involved posing with a statue of John Pershing. Then, on Monday, I got an alert about a cache placed 0.2 miles from my "home coordinates". It was a very small cache (a "nano"), which I don't find too interesting, but I stopped by on the way home on the chance that I might be "first to find". I was a couple of minutes too late, but I watched someone else find it (which was actually preferable, as I didn't have to find the silly thing hidden in a stop sign). Yesterday, I was at a conference in Gaithersburg, so between the conference and a reception, I headed out to another virtual cache. This one was based on Coffin Rock, from the Blair Witch Project movie. I dunno, never saw it, but it was an interesting 1/4-mile hike to the rock. All this is by way of saying I've been pumping up my statistics and am eager to update them. One motivation for finding 7 in a day over the weekend is that it replaced a day last August as my "best day"; I only found 3 then, and it didn't seem particularly great. Instead of maps, this time you're getting a much more compact representation of where I've been caching. 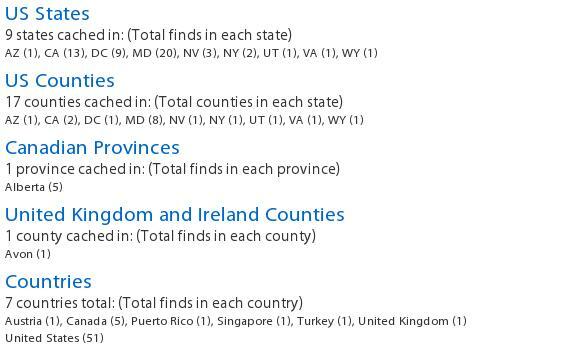 Note the additions of Canada and DC with multiple finds each. The number of counties in Maryland is off by 1 because it lists the stop-sign cache as "uncalculated", rather than Prince George's County. I'll have to send an e-mail about that...hmm, it's since cleared up on the site. Looking at the chart of terrain and difficulty ratings made me realize how many of the ones I've been doing have been clustered in the upper left. 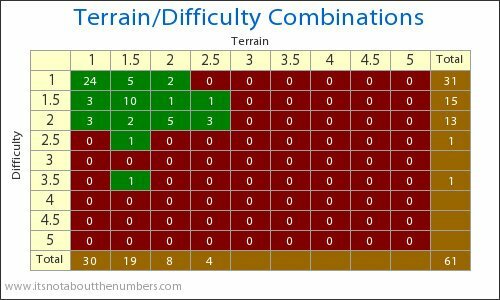 One reason for doing the stop-sign nano was to get a difficulty higher than 2.5. I may select caches to get specific terrain/difficulty combos in the future.